The Cowboys got embarrassed for the second time this season on national television, and during their sole appearance on Monday Night Football. The 45-28 final score was a lot closer than the game ever felt. Dustin Copening will walk you through what went down in Chicago, and has dug up some great Cowboys dysfunction audio to entertain you. 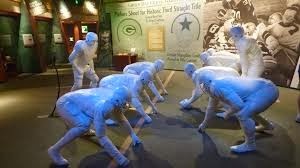 A must-win isn't a must-win until it's a must-win, but Monday night's loss in a must-win makes this game against the Packers a definite must-win. Got it? Good. Dustin has audio from Jason Garrett, Monte Kiffin and Mike McCarthy that's guaranteed to shock and amaze you, kinda. And he has enough numbers to choke a Cowboys fan into submission in the octagon. You'll get a prediction, matchups of intrigue, and much much more if you tune in, share with a friends, and call in!